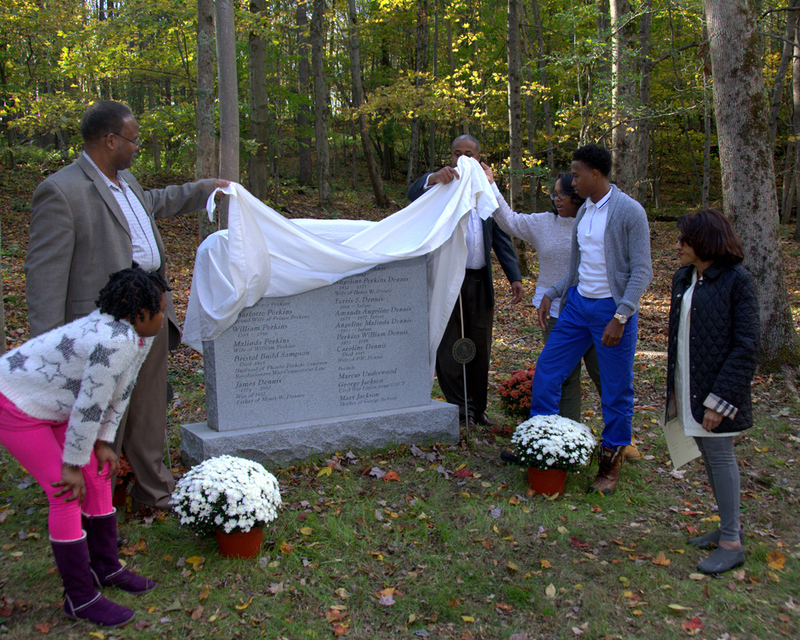 Lonnie Moore IV, eighth generation members of the family, unveil Perkins-Dennis Cemetery monument at dedication ceremony, October 8, 2014 as Denise Dennis looks on. One of the highlights of the Second Annual Dennis Farm Symposium was the unveiling and dedication of a monument in an alcove of trees, near the entrance to the Perkins-Dennis Cemetery. The names of family members interred in the cemetery are engraved on the monument, which is made of Vermont granite and stands on a base of eight square feet. Seventy-seven symposium guests gathered at the hilltop cemetery for the dedication ceremony that included remarks, the unveiling and a prayer. The ceremony ended with the singing of the “Battle Hymn of the Republic” and the “Star Spangled Banner” beneath the tall trees. The monument is the first change to the cemetery in a century.